Bowflex TC5000 TreadClimber offers a vast array of features including exceptional workout monitoring functionality and an ergonomic design. It’s designed to ensure you achieve fast and easy weight loss. The TC5000 has been replaced by the NEW TC10 Treadclimber, with a sleek new design, and several new features. Bowflex TC 5000 TreadClimber is designed to provide exceptional fitness results much more quickly than an ordinary treadmill. Get motivated with the climb indicator that displays every 100 feet of elevation. See all of your vital workout stats with 6 bright, easy-to-see LED readouts. Calorie-burn calculations are based on body weight and intensity inputs in addition to distance and speed for greater accuracy. The TC5000 TreadClimber is a top-quality exercise solution that’s designed to ensure that you get a superior workout every time that you use it. With a full range of cutting-edge features and superior ergonomics it’s designed to get you into great shape fast. A TreadClimber from Bowflex is an excellent choice if you’re looking for a high-powered and ultra-efficient workout. If you’re really serious about getting into better shape and staying fit you owe it to yourself to check out a TreadClimber. What are you waiting for? Browse our selection of Bowflex TreadClimbers to find the model you need to drop those extra pounds and get into great shape! 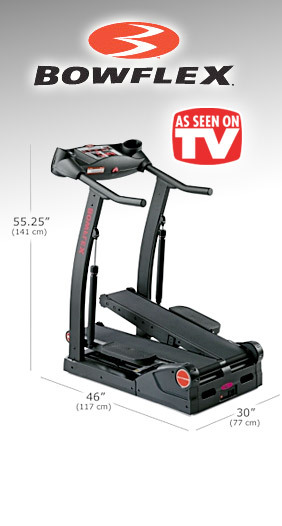 The TC5000 TreadClimber is a superior product, and Bowflex stands behind each and every one. Your satisfaction is guaranteed! Just purchase your machine (direct from Bowflex) and workout for up to six weeks. If you’re not 100% satisfied with the results, simply contact their customer service department for a Return Authorization, return the machine (including any accessories) in its original condition and packaging to receive a full refund, less shipping & handling. Item must be received no later than 2 weeks after your return authorization is given.